Happy New Year! 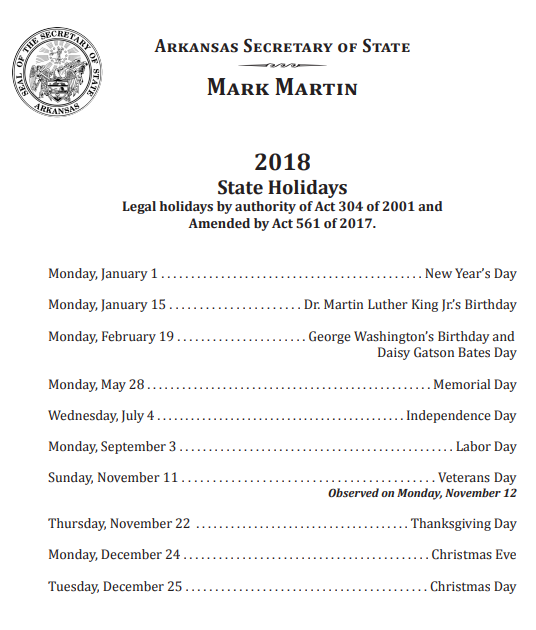 Below is a listing of the Official Arkansas State Holidays for 2018. State Capitol Offices and all State Buildings will be closed on these days. The State Capitol Building will, however, be open to visitors on weekends and holidays from 10:00 AM until 3:00 PM, unless otherwise noted. Click here to download a PDF of the official bulletin to print. You are receiving this notice because you signed up for Holiday Bulletin Notices from our office.